It's important to remember here that's what being announced today is the new rail franchise for the Wales and the Borders - so these are all improvements and changes to the current rail service. 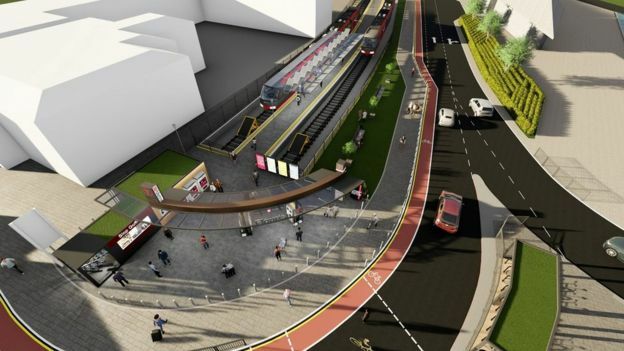 Other parts of the Metro plans, such as new bus and tram services, are seperate to today's announcement. Keolis Amey might well end up running those services as well but they would be subject to a seperate tendering process. Does anyone know if the new Flourish station is going to be next to Merchant place? Or will the tracks cross the A4119 and go right into/next-to Roald Dahl Plass? From the traffic shown Infront of the millennium center on the artist's impression, I'm guessing it will be next to Mrchant place. LocalResident wrote: Does anyone know if the new Flourish station is going to be next to Merchant place? Or will the tracks cross the A4119 and go right into/next-to Roald Dahl Plass? From the Metro map it looks like you will still need to go via Cardiff Queen Street to get to the Flourish. It's not going to be connected to Cardiff Central. They really need the Bay and Central connected, especially if they want the new arena down there. There's a new one in Aberystwyth too. So this is completely seperate to the Metro? So we could see plenty of extra light rail in Cardiff? I haven't read enough yet, and have only bothered looking at the metro map rather than any non Cardiff Capital Region services (which is what the Metro is covering I guess). It's basically all the existing regional services as far west as the Bridgend area and as far east as the various towns in Gwent. Longer term I'd really like Transport for Wales expand this so that we do get that line from Central to the Bay, more services to areas of Cardiff that have never had a train line running through them (like the newer suburbs). Outside of Cardiff surely Newport and the Gwent Valleys are a candidate for expansion. Ebbw Vale into Newport, a tram from Pontypool into Newport via Cwmbran, maybe the Caerphilly to Newport. We could go on forever making up new stations, new lines etc. It really is a long term project beyond the 2024 date...but it all costs money and the lines have got to be viable. But look at how popular the Ebbw Vale line into Cardiff has been. 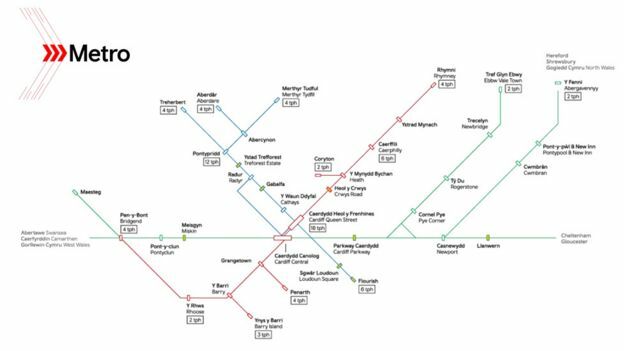 There's got to be a balance, and Cardiff has gained a few stations in this plan, which is good because other places in the area have had new stations over the last 20 years as well. Ebbw Vale to Newport is coming by May 2021. Any substantial expansion of the network is probably going to require devolution of the rail infrastructure budget, as Westminster is unlikely to be interested in much beyond Crossrail 2 and HS2 for the forseeable future. I think this is it until mid 2020s - got to sort out the existing system first before you add more. This is something I have thought about too. Methods of hydrogen production have got to the point where they’re approaching almost as much power back in hydrogen as it takes to produce it. Wales has an abundance of water and let’s face it ‘wind’, especially overnight during the winter when storm after storm races in from the west. At times when wind generation meets low demand from the grid, this is an ideal time to create hydrogen and store it for either putting back into the grid at peak time or using in public transport infrastructure. Whilst companies like Riversimple in Llandrindod Wells are developing the idea of a homegrown hydrogen car, I think it is highly optimistic that you’ll create a hydrogen network for road traffic, however it would be easier to supply to a small number of depots operating the metro and other transport services. Hydrogen fuel cells would not only do away with the need to electrify small rail branch lines but would give buses the smooth four wheel drive power delivery of an electric vehicle without the weight of batteries or an engine and fuel tank. Ideal for mountain roads! If Wales could lead the way in innovating in this sector it would help us be more self-reliant and less dependant on other countries for gas and oil.